If you’ve ever tried store bought pain relief cream, you know how soothing it can be on sore, achy joints and muscles. Here’s a DIY recipe that will let you create your own pain reliever balm at home for a fraction of the price. You can also customize this recipe to offer more intensity for chronic issues, or less intensity for minor problems. The essential oils stimulate natural heat, blood flow and circulation in your body, soothing soreness and offering pain relief for everything from muscle tightness to joint pain and arthritis. This balm can also aid those with chronic headaches, neck issues and respiratory problems. *You can use half as much of the essential oils or double if you want the formula to be more or less intense than the original. Begin by melting the beeswax and coconut oil together over a double boiler. Use low heat to ensure an even consistency. Stir mixture constantly until fully melted. The ingredients should be completely combined and the mixture should be smooth. The next step needs to be done as quickly as you can. The mixture will start to set once it’s removed from the heat, have everything ready to go before taking it off the stove. Pour the mixture into the glass jar and immediately add the essential oils to the jar. Using a small spoon, quickly stir the balm in the jar until well blended and then seal shut with a tight lid. *Note: It’s important to add the essential oils after the mixture is removed from the heat, but before the mixture sets. The oils need to be blended well with the mixture (while it’s still in liquid form), but will evaporate and lose potency if they’re added while it’s still in the double boiler. Adding them while in the jar, stirring and then shutting the lid will ensure they’re fully infused into the balm as it sets. Leaving the lid tightly shut, let the mixture cool down and set. The balm is done setting once it has almost cooled completely and has a cream like consistency. At this point, it is ready to apply. Use your fingers to gently apply and massage into your skin. Some like to use the balm while it is still warm and others love to double or triple this recipe to make a large batch that can be stored and used over time. Try it out for yourself and enjoy your own customized, all natural tiger balm pain relieving treatment. Let us know how you like it in the comments! Expired: Free Aveda Hand or Foot Relief Travel Size Lotion – $9 Value! Thank you for sharing this with us. Have a sweet day. Ohhh my word you can not understand how much I appreciate this helpful post! I will go grab the few items I do not have on hand and fix us up a batch. I sure will report back here & let you know how it works. I suffer from SLE (Lupus) My poor joints give me such distress. I use Tiger balm and Aspercreame like it is going outta style. My hubbie has a bad back so I am always rubbing the same creams I use on his poor back. This recipe will save me a fortune! Thank you again! Have an A+ kinda day! This is great! I use Tiger Balm all the time, thanks so much!! I will have to give this a try. Thank you for sharing. This sounds pretty good. Will be trying soon. I have to try this. Sounds great. had to have the ingredients on this .. must try .could get me out of my 4th spinal tap.. thank you for sharing this .. love it .. Thank you for thsi remedy can’t wait to try it! I am so into making my own products and the mix of essential oils in this one sounds heavenly! I’m going to get the oils tomorrow! Wow! This sounds awesome! We almost bought some Tiger Balm at the store but thought better of it b/c it was a little too expensive. I have pain everyday and would love to try this DIY pain relief cream/balm. I will have to wait until I get all of the necessary essential oils needed. Thanks for the recipe. Thanks for the help.This is going to be very useful. What an awesome idea! I will have to try this! Thank you for sharing this recipe. I’ve always wanted to make my own creams and such and to have this therapeutic cream would come in handy. Tiger’s Balm was a staple in our home when I was growing up. I haven’t seen it in store for years now. I will definitely have to try your homemade version. Thanks! Thanks for sharing. Going to make some for my grandpa! 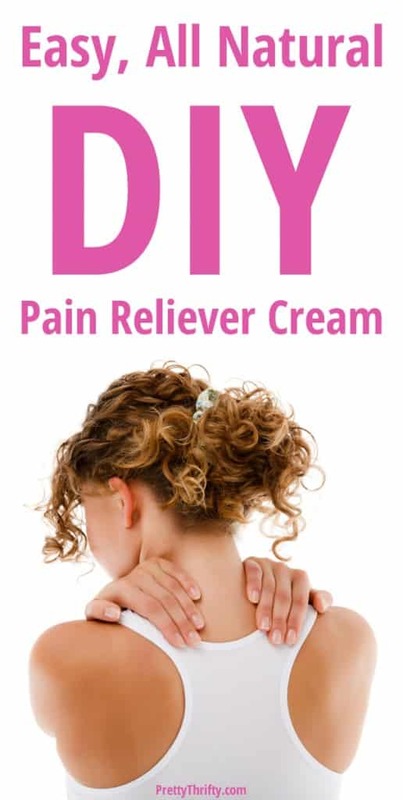 Thanks for the recipe for your “Homemade ‘Tiger’s Balm’ Pain Relief Cream”. I will definitely try it. Nice recipe for a useful remedy! Looking forward to trying this, have to assemble some ingredients. I love the soothing feeling on my shoulders and elbows, can’t wait to try. This is great! I had purchased some Tigers Balm from our acupuncturist, but I would much rather make some homemade! So many good essential oils in here – I’m sure it really helps with pain. Thanks for sharing! Which pain cream blistered you? I have very sensitive skin and I want to make sure I never use it! I too have pain everyday. I was in an elevator accident in 1998. I am disabled now. Woukd you also know where to buy the essential oils? Praying this helps you so very much and that you get a lot of relief! ! Hi, Everyone! I Enjoyed this Blog b/c I Suffer a Great Deal Everyday with Neck & Back Pain! Today I was Hurting So Bad that I Put MY Burt’s Bees Peppermint Foot Cream on My Neck and Believe it or Not It Actually Helped, but Only for a Short Period of Time! It’s Amazing the things We Will Go Through or the things We Will Try Just To Get Some Relief! I am Going to Try and Make My Own & Follow this Recipe as Soon as I can Get to the Herbal Shop! Thanks Again & God Bless! I have to pass this on to my friend who LOVES making her own hair and skin products. Clove oil really does help with pain – I’m a believer! About 3 weeks ago I mentioned that I used to use the actual Tiger Balm quite a bit and said I was going to give yours a try. After the initial costs, I found it works at least as well and I will actually be saving money because of the quantity. Thank you! I might have to try this out. My fiance always gets neck pains and I have constant back pain and this might help out. Thanks for the recipe. I really need to try this I have made my own deodorant before and it was great. I love trying to make my own products. (Homemade ‘Tiger’s Balm’ Pain Relief Cream) I like that you can make this up yourself in your own home. Thank-you for sharing this with us all. I’ve been making some DIY products and love it! I’d like to try this combo! I was just googling around for beeswax yesterday, I’ve read that the blocks are a pain to use, so I’m looking at pastilles / pellets. I wonder what is a good brand to use. I have organic coconut oil and some of the essential oils already. This sounds great. Gotta give it a try! i gotta try it, thanks for the great tip. so i tried this out and it was AMAZING! I have been having awful back pain since I have started running 4-5 times a week. THANK YOU!!!!!!!!!!!!!!!!!!!!!!!!!!! I’m definitely going to have to book mark this! I didn’t even think about making it at home. I love these homemade remedies, especially when they actually work. I am getting to be a big fan of essential oils too. I have learned so much from your blog postings, thank you. I have chronic pain and am always looking for something that will help, I will definitely try this out. Thank you. I’ll have to try this. I will definitely have to try this since I use a lot of stuff like this but it is expensive. Thanks for sharing. I’ll attempt this for my man’s back pain. Nothing has worked recently for his pain. I’ve had bad knees for years and would try a combination of pain pills and heating pads. Thanks for the post. I really enjoy DIYs because I know what I am exactly putting in it. Thanks for sharing! Oh how I could use some of this today! It’s been raining for days and my joints are killing me. Thank you! I’ll have to have my husband try this on his back. Sounds great. My husband can really use this. Thank you for sharing your recipe for homemade diy Tiger Balm pain reliever. I need to have a knee replacement and my knee hurts everyday and I can barely walk, so I will try this recipe very soon. I will definitely try it while it is warm. I love Tiger Balm. I think it is the only one out there that really works. Thanks for telling us how to make it. This recipe for tiger balm pain relief is so awesome.Thank you so much.Sometimes the these products can get expensive and it would be wonderful to make my own when I need it. I could use this as I am in constant pain. Wow! This is something I definitely want to try! I didn’t realize it had so many essential oils!